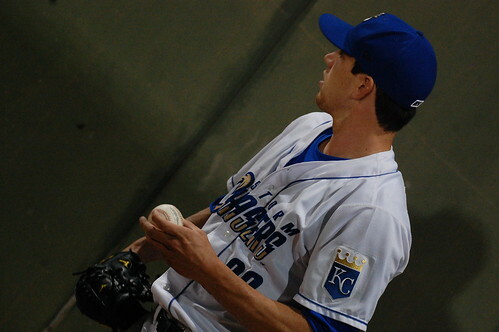 New Royal Donnie Joseph made his first appearance as a member of the Royals organization last night. His line does not look amazing, but I want to note that it wasn’t as bad an appearance as it looked in the box score. None of the 3 hits were hard-hit balls. One was a perfectly-executed bunt that ended up halfway between the mound and the plate, and neither Joseph nor catcher Adam Moore could get it picked up in time. The other two were stupid little bloops to right. I was shooting from the end of the Reno dugout that inning, and the players were rejoicing that both of those fell in, because they were lucky hits and all the players knew it. Both of the walks were intentional. So Joseph ended up with a rough-looking line for an outing that wasn’t THAT bad at all. It wasn’t perfect – he uncorked a wild pitch with the bases loaded that allowed a run to score, after all. But for those who just scanned last night’s box scores, these pieces of context are important to consider.